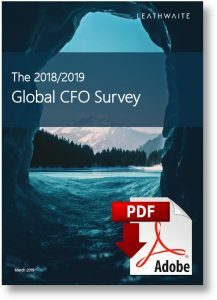 This year Leathwaite’s annual CFO Survey highlighted two significant themes. Firstly, the technology transformation that has taken hold of the industry is making its impact felt within finance functions globally. With over 70% of finance functions having undergone some form of digital innovation in the last year, up 34% annually, technology is fundamentally changing how these groups support their businesses. While the digitisation has streamlined process and improved operating velocity, it also means our leaders are grappling with the need for professionals with a much broader and deeper understanding of technology within their ranks. They need professionals who can drive technology, whilst also maintaining a talent pool that can grow into the rounded, commercial leader that is the CFO. Secondly, in the context of this change, CFOs are reflecting on their own career paths. Appetite is high to change roles – either into a COO role or to make the move to a smaller firm or an entrepreneurial venture. We now have the pleasure of releasing the findings, which you can download via the PDF report below.